Roads of the future could be lit by glowing trees instead of streetlamps, thanks to a breakthrough in creating bioluminescent plants, reports MIT News. Massachusetts Institute of Technology (MIT) engineers have taken a critical first step toward making that vision a reality. By embedding specialised nanoparticles into the leaves of a watercress plant, they induced the plants to give off dim light for nearly four hours. The chemical involved, which produced enough light to read a book by, is the same as is used by fireflies to create their characteristic shine. 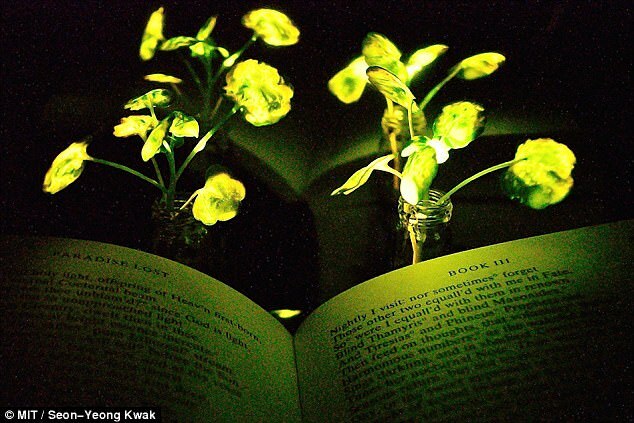 To create their glowing plants, engineers from MIT turned to an enzyme called luciferase. Luciferase acts on a molecule called luciferin, causing it to emit light. Another molecule called Co-enzyme A helps the process along by removing a reaction by product that can inhibit luciferase activity. The MIT team packaged each of these components into a different type of nanoparticle carrier. “The vision is to make a plant that will function as a desk lamp—a lamp that you don’t have to plug in. The light is ultimately powered by the energy metabolism of the plant itself,” says Michael Strano, Professor of Chemical Engineering at MIT and the senior author of the study. Lighting accounts for around 20 per cent of worldwide energy consumption, so replacing them with naturally bioluminescent plants would represent a significant cut to CO2 emissions. The researchers’ early efforts at the start of the project yielded plants that could glow for about 45 minutes, which they have since improved to 3.5 hours. The MIT team believes it can boost the light emitted, as well as the duration of light, by further optimising the concentration and release rates of the chemical components. For future versions of this technology, the team hopes to develop a way to paint or spray the nanoparticles onto plant leaves, which could make it possible to transform trees and other large plants into light sources. The researchers have also demonstrated that they can turn the light off by adding nanoparticles carrying a luciferase inhibitor. This could enable them to eventually create plants that shut off their light emission in response to environmental conditions such as sunlight, they say. The full findings of the study were published in the American Chemical Society journal Nano Letters.